It may not seem like it now, but we are in the last dregs of winter and spring is just around the corner. Soon we will not have to worry about scraping ice off the car in the morning, and neither will we have to wear layer on layer of clothing to avoid shivering all day long. As the weather begins to improve, children will be eager to get outside and play – and rightfully so. While we may live in an age where games consoles, smartphones and tablets are king, nothing compares to getting outside. If you are the parent of young children, fencing off a designated play area in your garden is sometimes a good idea. Separate the flower beds from where balls will be kicked and, if your household has pets, try to keep their areas separate from where children play. Obviously, this will be easier for those that are blessed with bigger gardens, but even if you have only a small area to call your own you can still make a designated play area. Sandpits, swings and other equipment can be easily stored away when they are not in use and brought out when the time is right. With flowers planted around the edges of the garden, you will make full use of the space – especially if you can add a small veg patch where the kids can get stuck in and play in the dirt too. 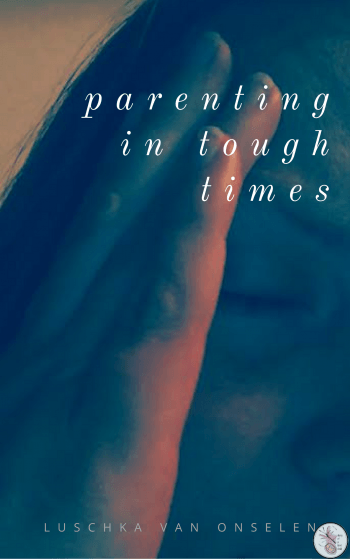 Kids fall over all the time; you aren’t going to stop this. What is in your power, however, is the type of surface that they fall on – concrete is going to hurt, whereas soft grass isn’t. If your garden isn’t ideal for growing a lawn, then why not consider artificial grass? You don’t necessarily have to pay a premium for a safe surface and you won’t have to maintain it as it doesn’t grow, making for an ideal feature to any garden with kids. It is common to find small gardens in big cities such as London, which is where the installation of artificial turf really does come in handy due to the close proximity of housing. 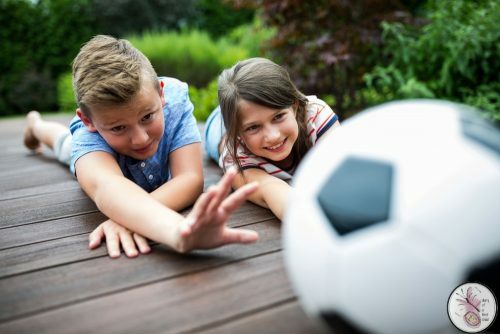 If your kids like to turn your back garden into Wembley Stadium, no doubt you have had to ask the neighbours on more than one occasion for your ball back. While you would like to think that they can keep the ball down, even top professionals miscue their shots from time to time, sending the ball into orbit. You may have to ask permission from neighbours before installing netting, it is courteous after all, but there should be no problem if it helps to avoid damaging their own garden. This way, even when the ball flies off target, the netting will help to keep the ball inside the confines of the garden. If your garden allows for it, definitely look to invest in outside apparatus such as swings, trampolines and sandpits as these will see a lot of use during the warmer months. 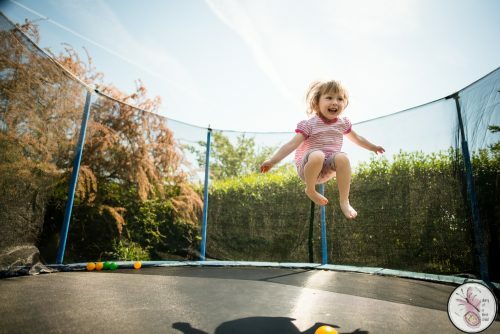 There was a time when it seemed that every house with kids had a trampoline in the garden and it was with good reaso n.
Not only is jumping on the trampoline great fun for the kids, it’s also great exercise, too. And remember, it doesn’t all have to be big and invasive either – sometimes small things like an outdoor chalk board or fairy garden can make even the smallest garden quite magical. Outdoor weather may seem a little way off yet, but it will be with us before you know it. When it does, we have to enjoy it because it never seems to stick around for long!